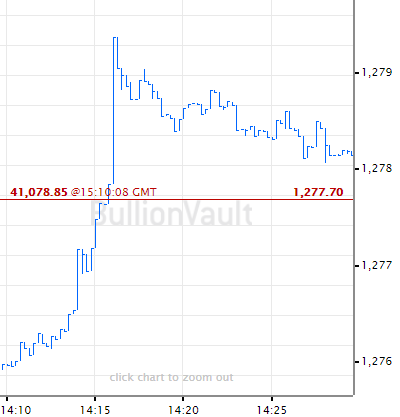 GOLD PRICES edged lower on Monday as the US Dollar hit 16-month highs on the currency market amid fresh concerns over UK Brexit turmoil and Italy's yawning budget deficit, writes Atsuko Whitehouse at BulllionVault. Crude oil meantime bounced 1.5% from its 10-day slump after Saudi Arabia said it's considering a steep output cut for December. The Opec oil cartel is " focused on mitigating downside risks" reckons Peter Kiernan, lead energy analyst at the Economist Intelligence Unit in Singapore, after crude prices declined by almost one-fifth from this autumn's multi-year highs on a surge in supply from top three producers the United States, Russia and Saudi Arabia. Spot gold meantime touched a new 1-month low of $1204 in Asian trade before regaining $3 per ounce in London business. 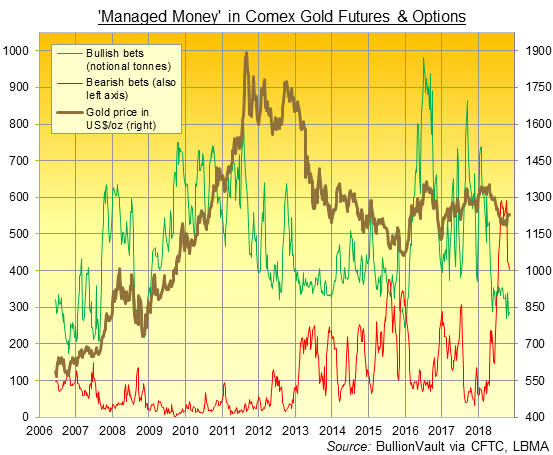 Hedge funds and other money managers last week trimmed their bearish positions in Comex gold futures and options by 4.3%, down for the 4th week running to the notional equivalent of 401 tonnes according to data from US regulators the CFTC. 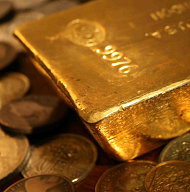 That group's bullish position was still smaller however, rising only 2.7% to the equivalent of 285 tonnes and leaving Managed Money speculators net bearish on gold overall for the 17th week in a row. 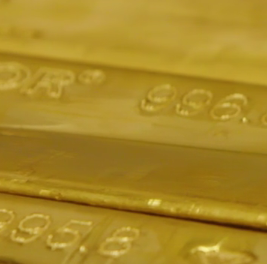 Holdings in the world's largest gold-backed exchange-traded fund, the SPDR Gold Trust (NYSEArca:GLD), meantime shrank 3.8 tonnes to 755 tonnes as shareholders cut their position overall. That was the first weekly drop in 5 for the world's largest gold-backed ETF trust fund. "The Dollar is gaining strength after last week's Fed meeting and positive US economic data, which is weighing on non-yielding assets like gold," says a note from Geojit Financial Services in Kochi, south-west India. In the UK, Prime Minister Theresa May was reportedly forced on Monday to drop plans for a cabinet meeting to agree her final Brexit deal with the European Union due to growing resistance within her own government following the high-profile resignation of 'EU Remainer' Jo Johnson, brother of arch-Brexiteer and former Foreign Secretary Boris. Gold prices for UK investors jumped 0.9% from Friday's close to regain the £940 per ounce level Monday morning as Sterling fell. The single Euro currency meantime hovered around 17-month lows against the US Dollar, slipping below $1.13 as the European Commission looked ready to escalate its budget battle with Italy. Tuesday marks the deadline set by the EU for Rome's left-right coalition to revise its 2019 spending plans as Giovanni Tria, Italy's economy minister, works to reach a deal, a government source said on Sunday. Gold prices for European investors climbed to reach €1073 Euro per ounce before halving that small 0.6% rally in afternoon trade. Italy's borrowing costs meantime ticked higher on the bond market while other Eurozone government yields eased back. US bond markets stayed closed Monday in observance of Veterans' Day.